I’m excited to announce the publication of a new book! Adventist Online Education: Realizing the Potential. It is a collection of research papers presented at the 2017 Adventist Online Learning Conference, edited by yours truly and Anthony Williams. I encourage you to check out the book. Hopefully you will find it useful in your online learning work. Below you can find the description from the back of the book. (4) the supports, training, and methods needed for the effectiveness of online delivery. If you are an administrator, online program director, or teach in an online program, this book will serve as a professional resource that can help ensure that programs offered effectively meet the needs of students while supporting and extending the school’s mission. This blog post accompanies my session, 20 Tools for Significant Learning and Student Engagement, presented at the Adventist International Institute of Advanced Studies, Silang, Philippines. Note that I have deliberately not included tons of sites and ideas because I wanted this to be simple and not too overwhelming. To pique interest. Evaluating and selecting content sources, i.e. YouTube, TedEd, books! Create a persuasive video to share on YouTube, Videoscribe, FlipGrid, or Animoto. Use GoogleSites to share the value and importance of a subject. Sample GoogleSite. Join an international debate at idebate.org. Blog or discuss ways in which one’s personal life affects and is affected by the subject via WordPress, VoiceThread, Weebly, Edublogs. Be an ethical, responsible member of a team serving others; tools to support groups: GoogleDrive and similar tools to support collaborative learning. Observation of real-life human experiences related to the content; report back to the class. Create a description or analysis or infographic of the relationship between two or more concepts with WordPress, Piktochart, or Infogram. Analyze and critique an issue or case study, and organize and present it via Padlet. Apply the skills in context; document ability with video via YouTube, Videoscribe, FlipGrid, or Animoto. Create a recommendation for a corporation in a real-world problem/situation, build and present on GoogleSites or PowToon. Create and share/narrate a mental map or conceptual structure of major concepts. Bubbl.us or Mindly the app or MindMeister. Have students access and interact with primary sources of content – i.e. TedEd, Library of Congress, and more. 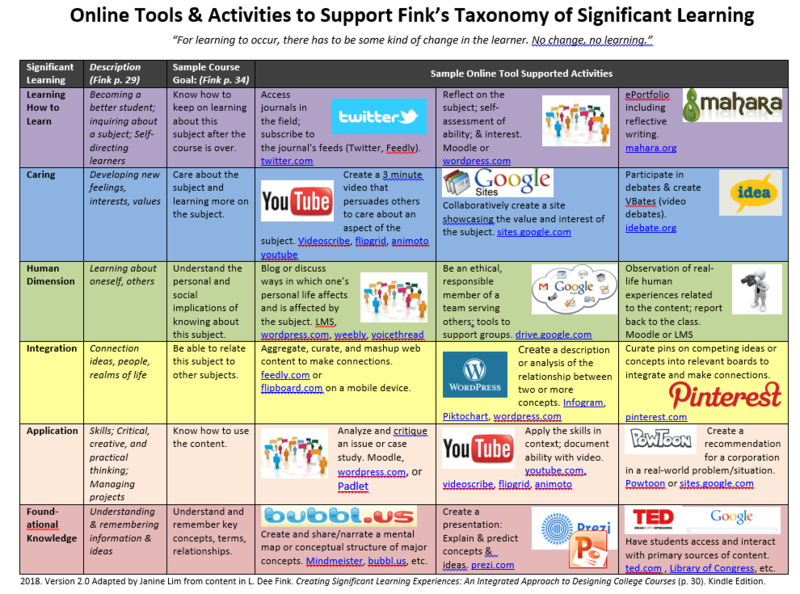 Fink Taxonomy and Tools v2 PDF Handout – Permission granted to reprint freely. Please share any adaptations. What would you add? Feel free to comment and share. This blog post accompanies my session, Gifts of Collaboration, presented for the AIIAS Academy faculty, Silang, Philippines. What do you see as the power of collaboration? What is collaborative online international learning? Cifuentes, L., & Murphy, K. L. (2000). Promoting multicultural understanding and positive self-concept through a distance learning community: cultural connections. Educational Technology Research and Development, 48(1), 69-83. Martinez, M. D., & MacMillan, G. (1998). A Joint Distance Learning Course in American Government (No. ED428005). Owston, R. (2007). Contextual factors that sustain innovative pedagogical practice using technology: an international study. Journal of Educational Change, 8(1), 61-77. Sweeney, M. A. (2007). The use of videoconferencing techniques which support constructivism in K-12 education. Dissertation Abstracts International. Yost, N. (2001). Lights, Camera, Action: Videoconferencing in Kindergarten. Paper presented at the Society for Information Technology and Teacher Education International Conference. For more videoconferencing related literature, see my research and dissertation. This blog post accompanies my session, Maximizing Learning, Implementation, and Reflection with Creative Professional Learning Models, presented at the 2018 Teachers’ Convention of the North American Division of the Seventh-day Adventist Church. PDF agenda, resources, instructions, handbook. Printed ahead of time. This blog post accompanies my session, Flipping Your Classroom, Personalizing Learning: Practical Strategies & Ideas, presented at the 2018 Teachers’ Convention of the North American Division of the Seventh-day Adventist Church. KnowledgeWorks: What is Personalized Learning? Lin Hsiao, J. W. D. (1998). The impact of reflective facilitation on middle school students’ self-regulated learning and their academic achievement in a computer-supported collaborative learning environment. (Ph.D.), The University of Texas at Austin, United States — Texas. ProQuest Digital Dissertation database. Mager, R. F., & Clark, C. (1963). Explorations in student-controlled instruction. Psychological Reports, 13(1), 71-76. 7 Unique Flipped Classroom Models – Which is Right for You? Flipped Classroom Skepticism: Is Flipped Learning Just Self-Teaching? This blog post accompanies my session, 20 Tools for Significant Learning and Student Engagement, presented at the 2018 Teachers’ Convention of the North American Division of the Seventh-day Adventist Church.